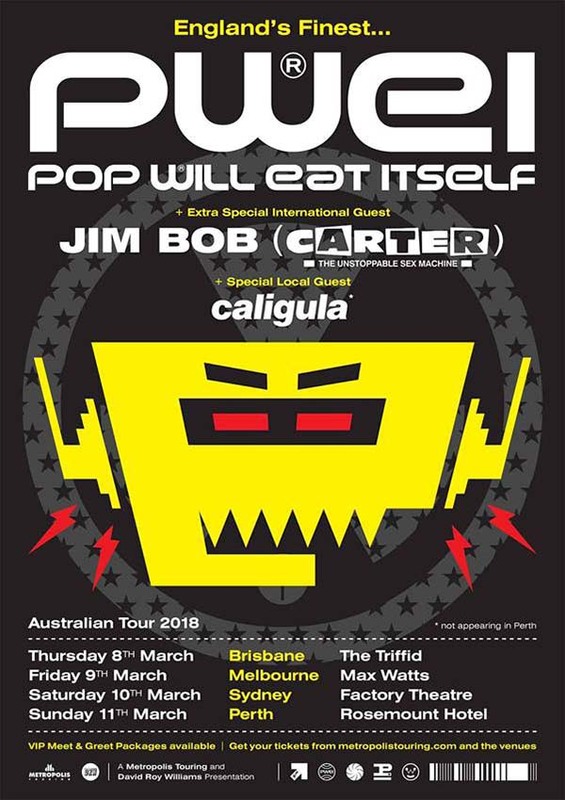 England’s finest, Pop Will Eat Itself aka PWEI aka the Poppies make a welcome return to Australia, with their high energy, relentless live shows an unmissable experience. During the late 80’s and early 90’s, Australia was like a second home for PWEI as they played a stack of memorable shows here, gaining a rabid following along the way. An incredible collection of songs and a setlist chock full of fan favourites - Everything’s Cool, Wise Up Sucker, Def Con One, Ich Bin Ein Auslander, Can U Dig It?, Dance of the Mad Bastards, PWEIzation, R.S.V.P, Their Law will ensure smiles all round. Joining original members Graham Crabb and Richard March (who went on to form Bentley Rhythm Ace post PWEI) in a reinvigorated line up of PWEI is legendary vocalist Mary Byker (Gaye Bykers on Acid, Apollo 440, Pitchshifter) and Davey Bennett. Clint Mansell is no longer with PWEI and has gone on to record award winning film scores. Jim Bob, best known as the singer of indie cult heroes Carter USM, will be joining PWEI as an extra special international guest. Carter USM last toured in 1995, so for Carter fans this will be a rare chance to hear all your faves - Sheriff Fatman, Anytime Anyplace Anywhere, The Only Living Boy in New Cross, Shoppers Paradise, Bloodsport for All and more as well as solo material. But wait, there’s more! We are stoked to announce that electro rock bandits Caligula will reform especially for this tour to perform their first shows together since 1994!